The start of the Balloch to Clydebank in the mid-50’s: note the station on the left. Clydesdale Harriers have been responsible for or in at the beginning of many of the developments in Scottish athletics: first open athletic club in Scotland in 1885, one of the first women’s clubs when they started the section in 1930, one of the very first with a Junior section – 1918 and so on right up into the 70’s. The Balloch to Clydebank Road Race was started up by the club to coincide with the Clydebank students charities day celebrations on 31st March 1928. It was described as a marathon race at that time and there were representatives of all four Dunbartonshire clubs forward. 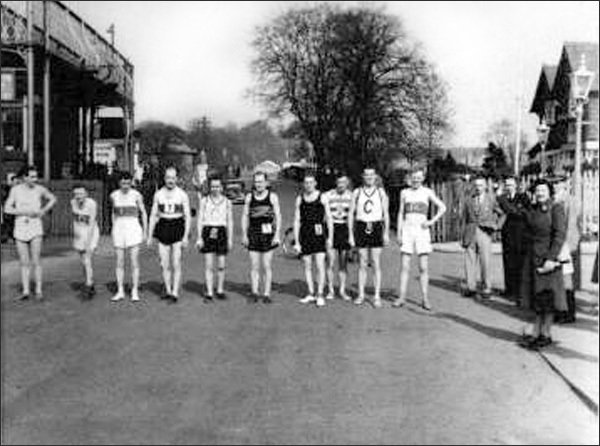 After the Second World War the race was organised by the newly formed Dunbartonshire Amateur Athletic Association and was stabilised at 12 miles. The race started at the Railway Station in Balloch, went up to what is now the Lomond Shores roundabout and turned off through the Renton and up Dumbarton High Street before heading off to Clydebank via Old Kilpatrick and Gavinburn to finish outside what was then the Masonic Halls before becoming the Q4 club. The long drag up to the AA Box at the junction of the Boulevard and the low road through Old Kilpatrick sorted out many a runner before the fast last 3+ miles into Clydebank. The competitors changed in the Bruce Street Baths in Clydebank and were transported to the start. It was confined to clubs in membership of the Association – Clydesdale Harriers, Dumbarton AAC, Vale of Leven AAC and Garscube Harriers. When I started out running on the roads sin the late 50’s and early 60’s there was pressure on the County to make it an open race. Fields dwindled however to such a extent that they eventually succumbed and it has since become just another mass participation half marathon. Although numbers were at times low the quality was top class. I ran in one race where top Irish runner Cyril O’Boyle raced a hard race against young Lachie Stewart of the Vale. A few years earlier Alex McDougall of the Vale who was a British Empire Games marathon runner had a hard, hard race against the same Cyril O’Boyle. Occasionally there would be an Englishman in the area on holiday or on a military posting – such as Bob Pape of the Navy – who would race in the event as a guest. Because there were only four clubs taking part and because the fixture list was so thin that they all met each other in inter-club friendly fixtures each year, the runners were all familiar with each other and the race had a ‘nice’ atmosphere. The numbers varied – in the year when Frank Haffey of Celtic let in nine English goals, we were racing the Balloch with a field of over twenty runners, by 1970 the race entry was down to three! At that point the race became an open event and the field swelled. By the late-70’s a Scottish Internationalist said that ‘you always started the year with the two Clydebank races – the other being the Clydesdale Harriers race for the Dunky Wright Cup. Then there was the Clydebank to Helensburgh the following month. Colin Youngson has this to say about the Balloch to Clydebank when it was a 12 Miles+ race: “Saturday, 10th March, 1973, was my first attempt at another West Classic – the Balloch to Clydebank Road Race (twelve and a quarter miles). I can only remember the course as quite flat and fast with one decent uphill and a thoroughly inconvenient downhill from Bowling to the finish. On this occasion a group of six was intact until nine miles with Edinburgh University’s Richard O’Brien leading most of the time. I made an effort on the hill, rested a bit and then went as hard as I could with two and a half miles to go. This got rid of Colin Martin (Dumbarton AAC) and three others but I had no chance of countering EU’s Jim Dingwall’s final sprint. He won in the new record of 60:52, with me (Victoria Park AAC) getting a plaque as Dunbartonshire champion. Colin (Dumbarton) finished in 61:23; and Clydesdale Harriers Phil Dolan (61:39) and Dougie Gemmell (62:19) were next followed by Richard O’Brien (63:26). 47 ran and Clydesdale with Ian Leggett seventh (63:44) won the team prize. The race grew in size and popularity and during the running boom years of the 80’s the numbers were often over 300 with a top of 484 athletes taking part inn 1984. It continued in this format until 2000 when it became a half marathon. It has followed the present course since 1984.